Pho has lost their arms, but Master Kongo believes them to be at the Chord Shore. 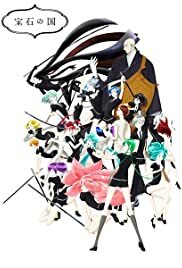 Antarcticite makes it their mission to piece Phos back together. Two girls wander a world destroyed by war. In the distant future, a new immortal and genderless life form called Gems populate the Earth. The 28 Gems must fight against the Lunarians, who attack them regularly to abduct them and to turn them into decorations. Each Gem is assigned a role, such as a fighter or a medic. Being only 300 years old, Phosphophyllite is the youngest of the Gems and has no assignment yet. They want to help to fight the Moon Dwellers, but are too weak and brittle for battle. One day the master of Gems, Kongou (Adamantine), assigns them the task of creating a natural history encyclopedia. I'm a massive fan of well-done animes, and the last one I rated really high was Darling in the Franxx. I was looking for new ones to watch, and accidentally stumbled upon this imdb page... I couldn't even find it on animeheaven, which really surprised me. So glad I gave it a try! It's an absolutely unique and beautiful style. The characters are all fleshed out well and each one has a very interesting personality - including the main character Phos. The story engaged me from the very start and kept me interested all the way through; it's impossible to go into depth without spoiling too much though! It's funny, but also quite sad at times. A bit of an emotional rollercoaster, but I thoroughly enjoyed it. I just really, really hope studio Orange make a second season - otherwise I will have to get into the manga to get the answers to all the questions that you will have by the end.